It was the last question after the webinar last night, and it was the best. The webinar was part of the Board for Certification of Genealogists’ webinar series,1 in association with Legacy Family Tree Webinars, and the topic was The Law and the Reasonably Exhaustive (Re)Search. The two points The Legal Genealogist was focusing on were: (1) there’s a difference between searching (looking for that one record that will give us The Answer) and researching (looking at all the records to uncover the complete story of our ancestors); and (2) — repeating the oh-so-common theme around here — to understand the records, we have to understand the law… and not in general but the law of the exact time when the record was created and in the exact place where the record was created. In every one of those cases we’d have missed critical clues if we didn’t understand the legal context of the records we were looking at. The simple answer: we always always always have to look at the law. The law gives us the context for the record — explaining why the record was created, the legal purpose it served, the information that the law required to be included. Without those clues, the record may be telling us something more — or different — than we realize. So my answer, last night, today, and every day: we look at the law every single time for every single record and every single record type. Knowing the legal context of the record is every bit as important to understanding that record in its time and place as knowing the neighorhood in which an ancestor lived to put that ancestor into the context of his time and place. Great question, and thank you, Barbara, for asking it. Judy the webinar was great last night. From now on with my library patrons I will start recommending legal sources in ways I haven’t in the past. The law and genealogy may start out at intermediate level but it very quickly becomes advanced. 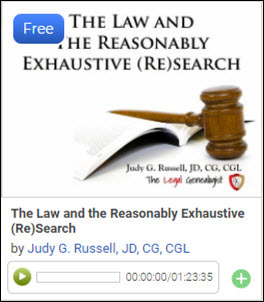 It is much harder for the average genealogist to find needed sources of law than it is for an attorney. However, it is very important to consult the laws. The legal sources allow you to get new information out of records you already have, find new sources of information, and find ancestors in the laws and records of a legislature. These records did not burn in a courthouse fire and yield new research because no one has consulted them. I had to go back as far as the 1785 legal code to explain the land Quality column on Georgia tax lists. That contains the legal guidelines for the state of Georgia land tax before the Civil War. Some of these records are far from the usual genealogy track. Legal records and laws of the Confederate Congress and Confederate national courts are examples of records most people are not aware of. I had to use Confederate laws to understand the Confederate public land sales.